In the previous article (http://ponnadi.blogspot.in/2012/11/archavathara-anubhavam-nayanar-anubhavam.html) we enjoyed azhagiya maNavALa perumAL nAyanAr's archAvathAra anubhavam. Let us now move on to see how vEdhAnthAchAryar enjoyed archAvathAra emperumAns. mAmunigaL glorifies vedhAnthAchAryar as abhiyukthar (a learned man) in rahasya grantha vyAkyAnams. His deep knowledge in sAsthram and subsequently aruLicheyal made him a lion amongst vidhwAns. Not only he had jnAnam, his vairAgyam was also equally great. Following the foot steps of kUrathAzhwAn, vEdhAnthAchAryar had no attachment to any material comforts and simply performed unja vruthi (bikshai) for his livelihood. He sung many sthOthrams glorifying many archAvathAra emperumAns. Let us see some of his anubhavam now. vEdhAnthAchAryar had great attachment towards dhEva perumAL and spent his life in performing ubhaya vEdhAntha kAlakshEpam in kAnchipuram. vidhyAraNyar (a mAdhva sampradhAya scholar) who is one of his close friends, once sends a note to vEdhAnthAchAryar to come and accept great wealth from the vijayanagara king on whom he had great influence. Seeing this vEdhAnthAchAryar became upset thinking that, vidhyAraNyar is inviting him to accept wealth even after knowing his nishtai and virakthi. He immediately wrote a short slOkam exhibiting his virakthi in material wealth and showing his extreme attachment to dhEva perumAL. I dont have any wealth left to me by my father. Nor I have any wealth which was earned by me. 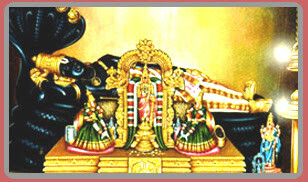 But, on top of the hasthigiri, I have my great wealth which is given to me by my ancestors. Needless to say, ancestors mean our guru paramparai only. kAnchi swamy shows that, wealth given by father usually cannot be easily disposed since it has to be carried forward to the next generation and wealth earned by self is usually filled with difficulties but wealth given by ancestors is effortless and free to enjoy. But even after receiving this note, vidhyAraNyar insists that he wants to help vEdhAnthAchAryar. Out of utmost virakthi, vEdhAnthAchAryar writes vairAgya panchakam where he beautifully demonstrates that emperumAn is the only wealth for prapannas and all other material aspirations and wealth are simply trouble for our spiritual life. Let us know see the last slOkam from this grantham. Let this wealth which is acquired by glorifying the kings (and wealthy) to pacify the jAtarAgni (hunger) be destroyed completely. We dont need that. We need the wealth (emperumAn himself) that groomed arjunan, that lifted the gOvardhana hill to protect the gOpas and gOpis, that which becomes the means for us to achieve the ultimate goal in life, that which will not give any sorrows to the ones who performs surrender and worship. That wealth is the wealth of sri mahAlakshmi herself (sriya srIyam, thiruvkkum thiruvAgiya selvan) and we have have that wealth (which means we dont need any other wealth). kAnchi swamy shows that unlike material wealth which diminishes as we enjoy it, anubhavam with emperumAn increases more and more as we enjoy it. Also, material wealth needs to be carefully protected from thieves, etc., spiritual wealth will be protected by emperumAn himself. thirumangai AzhwAr enjoyed thirupputkuzhi emperumAn as "putkuzhi em pOrERRai" (புட்குழி எம் போரேற்றை) meaning he is an "unstoppable bull in the battlefield". vEdhAnthAchAryar also enjoys vijayarAghavan emperumAn as samarabhungava, raNabhungava, etc along the same lines in his paramArtha sthuthi which is dedicated to thirupputkuzhi emperumAn. 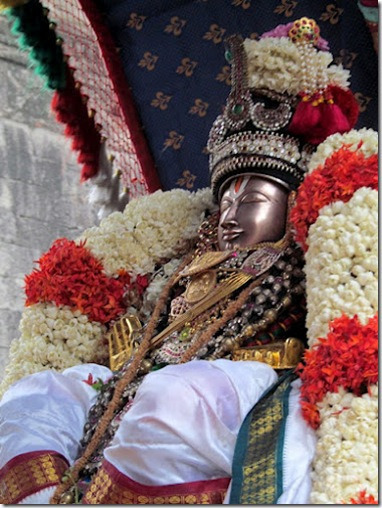 In this dhivyadhEsam, It is said that jatAyu's charama thirumEni was put to rest in this dhivyadhEsam so it is called putkuzhi (pit of the bird). chakkaravarthy thirumagan exhibited his parathvam and mOksha prathathvam by sending jatAyu mahArajar to paramapadham. We can recollect an interesting idhihyam in this regard. When Naduvil thiruvIdhi piLLai bhattar (who was initially not very favourable towards NampiLLai) is questioned by a king how srI rAman can give mOksham to jatAyu mahArAjar after deciding not to show his parathvam in this avathAram. Naduvil thiruvIdhi piLLai bhattar is not sure how to answer the question but fortunately the king moves away for some other purpose for a few moments. At that time, he asks pinbhazhagiya perumAL jIyar who accompanied him to the king's court how NampiLLai would have explained this. jIyar says "NampiLLai explains this easily using sathyEna loKAn jayathi" - understanding that he quickly turns around to the king and explains the same. The king is very pleased and honours him with many valuables. sathyEna lOkAn jayathi means one who is 100% truthful will conquer all words and since chakkaravarthy thirumagan was 100% truthful he conquers all worlds including paramapadham - so it can easily be explained that he gave paramapadham just by his humanly abilities. Naduvil thiruvIdhi piLLai bhattar immediately goes to NampiLLai, falls at his lotus feet and offers all the wealth to him and says that a few words from him is worth so much. Naduvil thiruvIdhi piLLai bhattar accepts NampiLLai as AchAryan and constantly serves him then onwards. Let us enjoy the 4th slOkam from this prabhandham now. Oh Ahavabhungava! To exhibit and give your protection you stood in the beginning of praNavam (as akAram) and you sat in the chariot of arjunan as the charioteer. Mediating on your rakshakathvam (protection), AzhwArs glorified you as "pOrERu" (போரேறு). They named you as such because you are relieving them of their hurdles in reaching you. As piLLai lOkAchAryar explains in mumukshupadi sUthram 36 - "rakshikkaiyAvathu - virOdhiyaip pOkkugaiyum apEkshithaththaik kodukkaiyum" (ரக்ஷிக்கையாவது - விரோதியைப் போக்குகையும் அபேக்ஷிதத்தைக் கொடுக்கையும்) meaning "giving protection means removing the hurdles and providing what is desired", vEdhAnthAchAryar also enjoys vijayarAghavan emperumAn's protectorship in a similar way. When vEdhAnthAchAryar arrived to srirangam to stay and perform mangaLAsAsanam there, he compiled bhagavath dhyAna sOpAnam among other sthOthrams on periya perumAL. vEdhAnthAchAryar enjoys periya perumAL's thirumEni following in the foot steps of thiruppANAzhwAr. 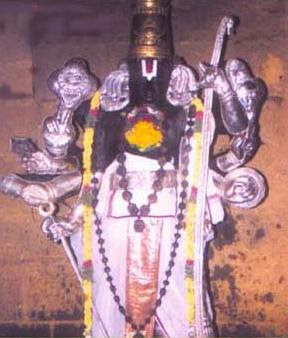 kAnchi swAmy points out that this prabhandham is named "bhagavth dhyAna sOpAnam" instead of "srIrangarAja dhyAna sOpAnam" because bhagavath shabdham commonly points to periya perumAL only. Let us enjoy the 1st slOkam. That emperumAn who is seen by yOgis in their hearts as a brilliant/bright light, who is like chinthAmaNi (a type of stone) which gives whatever is desired by the owner of the same, who is like the divine eyes for the vEdhAnthis, who is the lord of all dhEvathais and who is easily approachable by us (who are incapable of doing anything on our own and have no other refuge other than emperumAn) is visibly seen inside srIranga vimAnam as periya perumAL. vEdhAnthAchAryar is following the footsteps of AzhwArs who glorified emperumAn as chinthAmaNi and bhattar who glorified periya perumAL as "srIsthaNAbharaNam thEja: srIranEchayamAchrayE, chiNthAmaNi mivOthvAntham uthsangE anantha bhOgina:". Also, chinthAmaNi stone which fulfills the desires is very rare to find in this world, but emperumAn's saulabhyam is beautifully exhibited by descending to and residing permanently in srIrangam. 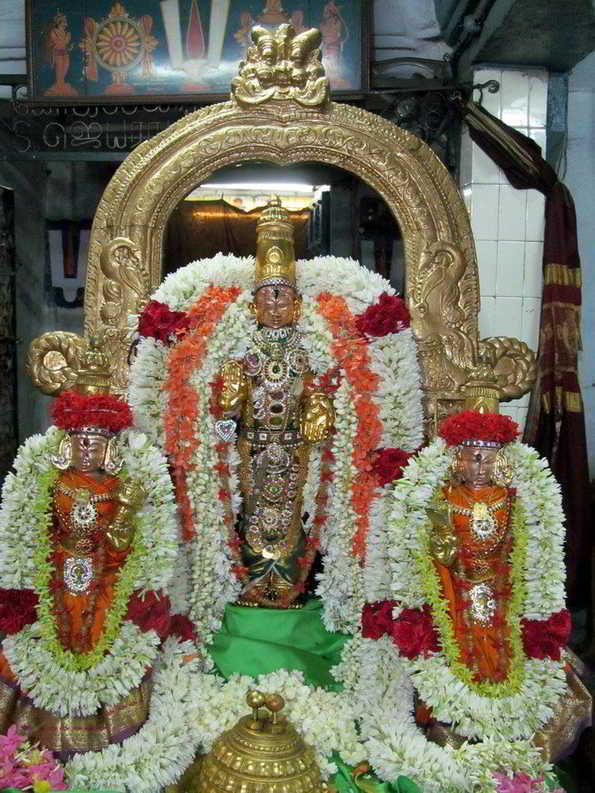 peyAzhwAr glorifies ashtabhujam emperumAn as gajendhra varadhan in mUnRAm thiruvanthAdhi 99th pAsuram. ashtabhujam emperumAn who is victorious in all battles came to the rescue of gajEndhrAzhwAn who was attacked by the crocodile and threw his chakkaram to kill the crocodile. Such emperumAn's lotus feet is our only refuge. vEdhAnthAchAryar, following in the footsteps of pEyAzhwAr, starts his ashtabhujAshtakam with "gajEndhra rakshAthvaritham" meaning one who arrived very fast to rescue gajEndhrAzhwAn. Let us enjoy the sixth slOkam where vEdhAnthAchAryar declares that emperumAn is the only upAyam and our acts are of no use. Oh asthabhuja emperumAn who is the dear of husband of lakshmI! you have to protect me who is fully surrendered to you. When you are making efforts to protect me my efforts are useless (since the protection will happen) and when you are not making any efforts to protect me my efforts are useless as well (since the protection will not happen). kanchi swAmy shows in the vyAkyAnam that this slOkam demonstrates our ananya upAyathvam that emperumAn is the only upAyam for us. Also, to accept emperumAn as upAyam, first we need purushakAram of pirAtti, that is why vEdhAnthAchAryar invokes emperumAn's sriya:pathithvam in the first line itself. This divhya dhEsam is very close to vEdhAnthAchAryar's avathAra sthalam thUppul. vEdhAnthAchAryar explains emperumAn's rakshakathvam in kAmAsikAshtakamm on vELukkai ALari emperumAn in slOkam 7. This is similar to what we observed in ashtabhujam emperumAn's sthOthram as well. When you are ready to protect us why do we need some one else to do that. When you are not going to protect us what is the use of any one else protecting us. With such firm faith in my mind, I bow to you who is staying on the banks of river vEgavathi. piLLai lOkAchAryar explains emperumAn's rakshakathvam precisely in prapanna parithrANam. He himself refers to this in mumukshupadi sUtham 39 "'Ichvaranai ozhiNthavargaL rakshakarallar' ennumidam prapaNNa parithrAnNaththilE chonnOm" ('ஈச்வரனை ஒழிந்தவர்கள் ரக்ஷகரல்லர்' என்னுமிடம் ப்ரபந்ந பரித்ராணத்திலே சொன்னோம்) meaning anyone but emperumAn cannot protect us truly is explained in prapanna parithrANam. vEdhAnthAchAryar explains the same concept in this slOkam. 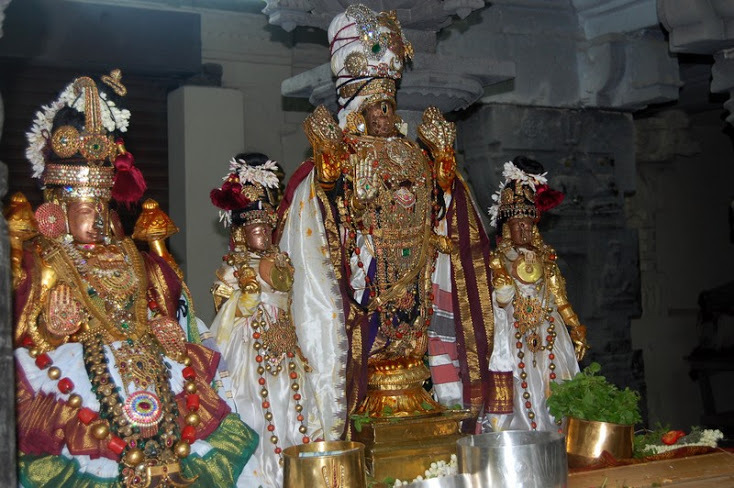 dhEvanAyaka panchAsath for dhEvanAthan emperumAn (thiruvahindhrapuram) - vEdhAnthAchAryar lived in this dhivyadhEsam and while doing upAsanam of garuda manthram here, garudAzhwAr appears to him and performs hayagrIva manthrOpadhEsam. vEdhAnthAchAryar performs hayagrIva manthra japam for many days and finally hayagrIvan emperumAn appears and blesses him fully and out of ecstasy and gratitute, he compiles hayagrIva sthOthram glorifying hayagrIvan emperumAn. Of all the dhivya prabhandhams, he has written a vyAkyAnam for amalanAdhipirAn of thiruppANAzhwAr which fully focusses on periya perumAL's thirumEni anubhavam. We have enjoyed AzhwAr's anubhavam already in http://ponnadi.blogspot.in/2012/10/archavathara-anubhavam-thiruppanazhwar.html. Thus we can understand how vEdhAnthAchAryar enjoyed and established the glories of archAvathAra emperumAns through his sthOthra granthams, etc. 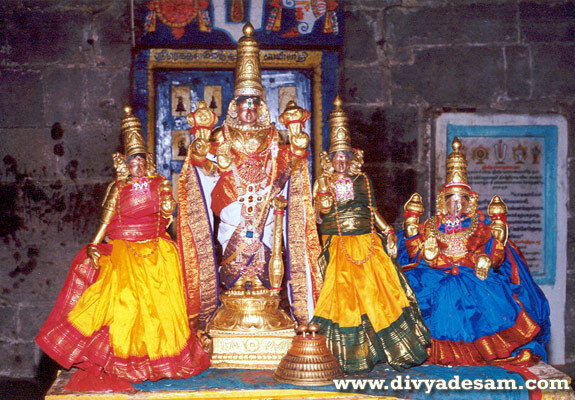 In the next article we will see azhagiya maNavALa mAmunigaL's archAvathAra anubhavam.